The location of Tihi Retreat gives visitors a birds eye view of the entire Rotorua basin with unobstructed and unsurpassed views in every direction, and is perfectly positioned within a stones throw of many of our cities attractions including the popular Whakarewarewa Redwood Forest and mountain biking trails which can be seen from almost every room in the house. Two guest bedrooms with spectacular forest views are each complimented by full ensuites, including large double ended baths, fully tiled showers with additional rain showers, heated towel rails and mirrors, hair dryers, LED TVs and Audio. The master suite occupies the entire first floor and includes a walk through wardrobe, lounge, built in desk/study, private decks and a well appointed luxurious ensuite. The view from here is breathtaking. 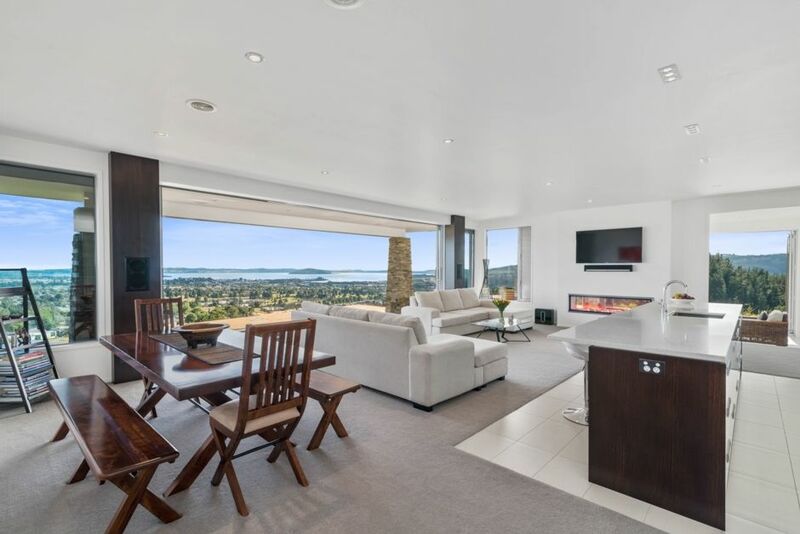 The main living/dining/kitchen area is the centre of the house with awe-inspiring views over the entire city, suburbs, lake, forestry and thermal area. An adjoining step down lounge with views you can almost touch in every direction is a place where you can sit and ponder, read a book, watch tv, listen to music or just be hypnotized by the views. Another lounge at the opposite end of the house is another restful area where the views of the city and suburbs are equally impressive. Listen to your favorite music here or watch a block buster movie with crystal clear audio/visual. Expansive exotic timber decks allow visitors to relax on outdoor furniture scattered around the house. And as the sun sets watch the city come to life with it's dazzling display of lights. After the sun sets take a stroll down past the native gardens to view our resident glow worms. Thanks for everything Steve. The house is gorgeous and a great stay was had by all. Owner very helpful. Amazing residence. The location is outstanding! Impressive views and a huge modern house with everything you need! You could not ask for more!!! One of the best baches I have ever stayed in. Awesome place with beautiful views wand a very functional modern home. If I could give 10 stars I would. My small initimate wedding was perfect, wouldn't have had it at any other place. Sound system is awesome and everything you could ever need in a luxury place is provided. We will definitely come back! This property is built on a very unique and beautiful location. This property is built on a very unique and beautiful location. It is basically at the very top of a crest, which gives it commanding 360 degrees views. The views extend to lake Rotorua, the city, and the surrounding mountains. It is built based on modern, structurally significant space planning utilizing truly first rate construction, and boasts every modern convenience. The kitchen has everything you can ask for to prepare a gourmet meal, the bathrooms are fabulous, as are the AV equipment.